I’m not quite sure whether I mentioned it before, but in my humble opinion my husband is a pretty cool person and he did some pretty cool things in his life. At some point he decided to take a break from the regular “9-5” to do a few different seasonal jobs for a year. He worked on a ski slope in Vermont during winter months, helping keep the ski slopes nice and smooth. During summer months he crewed a sailboat, transporting from Trinidad to Saint Lucia. After which he took a mini-vacation on the islands for awhile. This wasn’t a regular vacation. He didn’t have anything set up nor did he want to spend his hard earned money. Instead, he decided to just wander around, sleep on the beach and crash hotels’ breakfast bars. I love my beach bum…. But in my opinion the coolest job he held during this year of seasonal employments, was working for salmon cannery in Alaska. Whenever we have salmon for dinner, he tells me little stories about this experience. I love listen to them and imagine him soaked in salmon up to his chest on a dirty, smelly fish boat, sucking the salmon out of the boat (in what he equates to a huge vacuum) to conveyor belts to be fileted…. And then stories about bald eagles being as ubiquitous in Alaska as pigeons in the city. And huge brown Kodiak bears digging in their garbage and roaming around the cannery. I’m not quite sure how people in Alaska deal with all of this wild life. I admit I’d be pretty scared. But that’s just me… I’m scared of bugs…so there’s no surprise that stories of wild animals flying and living right next to you gives me the chills. And I’m grateful that my husband didn’t get himself hurt over there, so that years later he was able to find me and marry me! So…salmon was for dinner in our house not so long ago when we were hosting my mother-in-law and her twin sister LaLa (aka, Laura). We had a great time, and they said they ate like queens – in a very good restaurant – for a couple of days straight. In fact, LaLa specifically said that this salmon was the best salmon she’d ever eaten; and she eats her salmon pretty often. Not a bad endorsement. Thanks LaLa! Now obviously it isn’t only me encouraging you to try this dish, but in that it has a LaLa endorsement it seems foolish not to try. 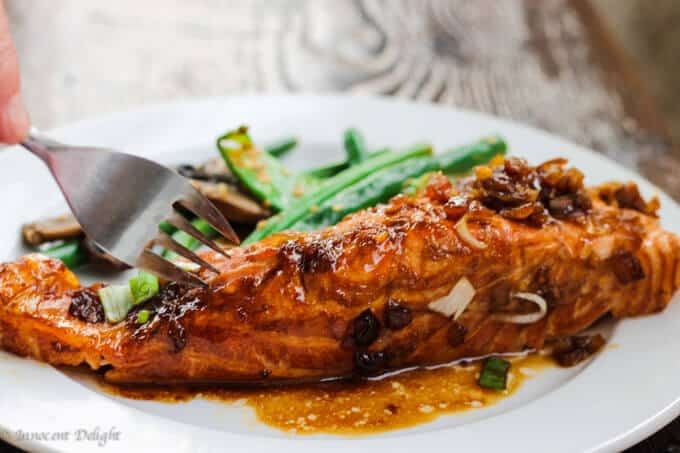 A couple of years ago, I was invited to my friends for dinner and they made this awesome salmon teriyaki in foil on the grill. I still remember how much I liked it. My friend used regular store bought teriyaki sauce but the fish came out super delicious. I decided to take it up a notch and create my own teriyaki sauce. It was the matter of adding this, tasting that; then adding more of this and that, until I got to the point that I was satisfied with my creation. 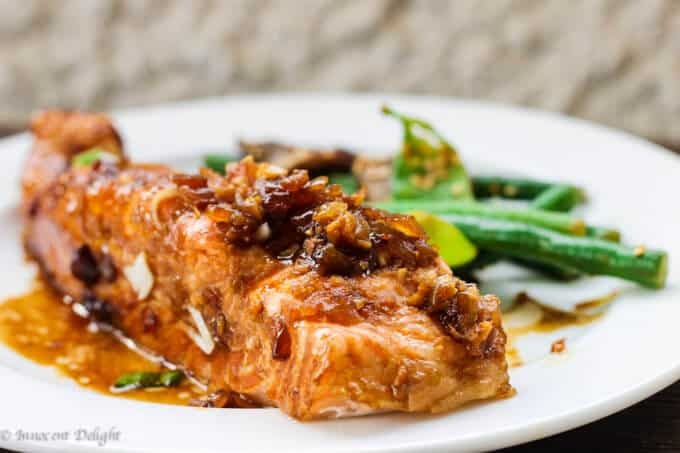 My sauce contains soy sauce, mirin, honey, lime juice, molasses, shallots, garlic and ginger. 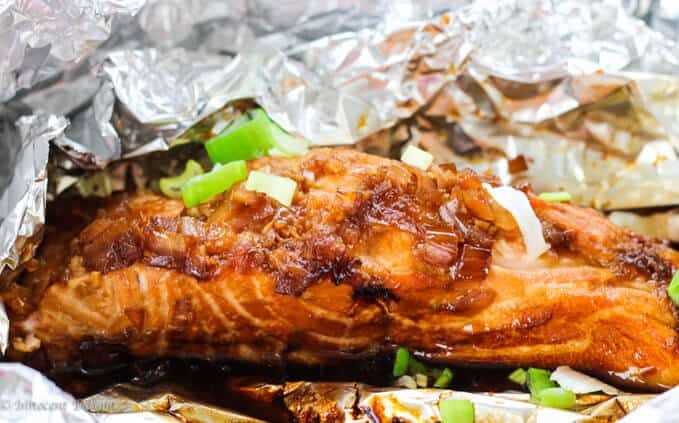 I spoon it over the salmon placed on the piece of doubled aluminum foil, folded in a packet and put it on the grill. 20 minutes later you won’t believe what you are putting into your mouth! 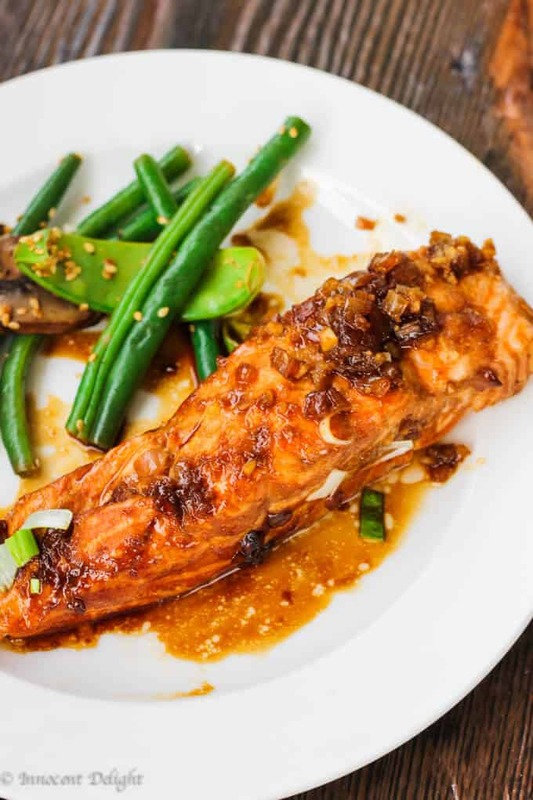 The taste of this Grilled salmon with simple homemade teriyaki sauce defies my ability to describe it. Just give it a try. In a small bowl mix together: shallot, garlic, ginger, soy sauce, honey, Mirin, Molasas and lime juice. 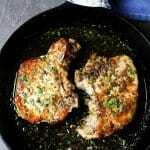 Serve with rice and greens of your choice. 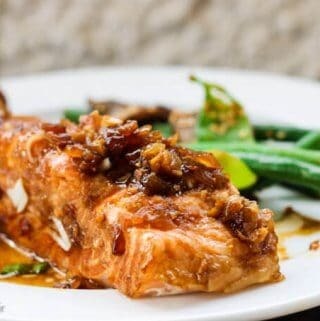 My family loves salmon and we get fantastic king salmon from our pacific coast. 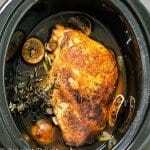 It is delicious and I’m always looking for new recipes. What a great idea to make your own teriyaki sauce. 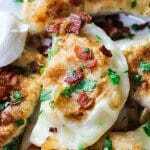 This recipe is simple and delicious. The homemade Teriyaki sauce was something I had never tried to make, and my family loved it. Thank you for a great recipe.